The Altino Arantes Building is a notable skyscraper located in Sao Paulo, Brazil. It is also known as the Banespa Building and was once known as the tallest building in the city when it was completed in the 1940’s. It was also known as the world’s largest structure made out of reinforced concrete at that time. It is currently one of the most recognizable buildings in the city and is a known landmark. The Altino Arantes Building was planned to become the headquarters of the Bank of the State of Sao Paulo or Banespa. The bank needed a larger headquarters after a period of substantial expansion. It was initially planned for construction in an area away from city’s banking district. But eventually, the bank purchased a building on Joao Bricola Street, which was nearer an area of economic prominence. The old building was demolished to make way for the bank’s new headquarters. Construction began on September 19, 1939. Its architect, Plinio Botelho do Amaral, provided the initial building design. 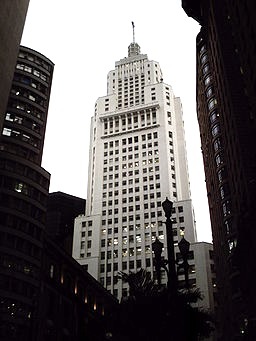 But the contracting firm, Camargo Mesquita, wanted to construct a skyscraper similar to the Empire State Building. It was redesigned into a building similar to the said US landmark and inspired by Frank Lloyd Wright. The building took eight years to construct, which stopped when World War II broke out. The construction resumed after the war was over. The building was eventually completed and inaugurated on June 27, 1947. The Altino Arantes Building stands 528 feet or 161 meters tall. It has a total of 36 floors above ground, serviced by a total of 14 elevators. This Art Deco/Art Moderne skyscraper was considered as the tallest concrete structure in the world. It held this distinction until 1962, when it was surpassed by Marina City I in Chicago. It was also considered as the tallest building in the world outside of the US when it was first inaugurated. It held the honor of the city’s tallest building until 1960. The main lobby of the Altino Arantes Building has 16-meter tall walls, which are coated with white marble. There is a museum located at the third floor of the building, housing photos from the 1940’s, objects used at the time of its inauguration and newspaper articles about the building through the years. Although it is no longer the tallest building in the city, the Altino Arantes Building is built on the highest point of the city’s downtown area. It provides the best panoramic view of the city on top of its observation deck. It is considered as one of the best spots for sightseeing. Around 5,600 people visit the observation deck to see the whole city every month.